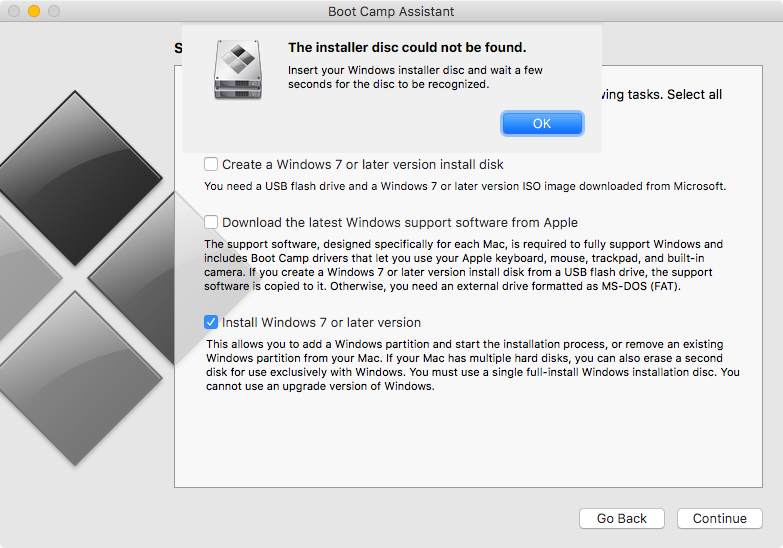 I need to install Windows 10 on my Macbook Air Mid-2013 (MacBookAir6,1) via bootcamp, for various reasons I cannot use USB, as far as I know since El Capitan it's possible to install Windows without using a USB or DiskDrive, however only on some newer 2015 models. As you can see OSX tells me to insert the installer disk, I also tried to mount the ISO (no luck even there). Can I spoof my model id to look like a 2015mba? As far as I know no hardware is pulling back this "no-usb" procedure that is available on newer macbooks so it should work even on older MACs. Open Boot Camp and select the first option. You have to select the size of the partition, after that it should automatically install the drivers and reboot on the Windows installation. Not the answer you're looking for? Browse other questions tagged bootcamp windows sierra usb windows-7 .